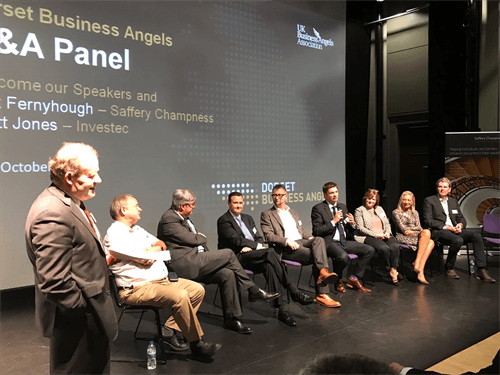 Dorset Business Angels (DBA) hosted its 3rd Angel Investor conference in Bournemouth which inspired, challenged and stimulated lots of lively debate. The event included a packed programme of inspirational speakers, from eminent, experienced global investors to leaders of industry. Don McQueen explained the process for angel investment based upon his personal experience of investing, see a video of his presenatation here. DBA Chairman, Don McQueen opened the biennial event and welcomed the audience who were immediately captivated by the first speaker as Jenny Tooth OBE, CEO of UK Business Angels Association (UKBAA) took to the floor. Jenny explained how UKBAA is a trade body for Angel investment, working with 68 groups such as DBA and works alongside other investor partners. These include private equity funds, corporate investors and crowd funding platforms. She also stressed the vital role that EIS and SEIS played as a tax incentive to investors. UKBAA build and connect the Angel community. We represent the views of Angels to Government. We’re very keen to respond to Government consultation and build an effective environment for Angel investment going forward. We are a resource and source of new market intelligence. We’re keen to help Angels find good deal flow. There’s a lot of noise out there and finding the rights entrepreneurs to invest in is important. We’ve also built an investors’ deal share platform where Angels can share deals that they are starting to build around local entrepreneurs and share around the country and other parts of the investment community. 65% of Angel investment happens in the London, Oxford, Cambridge triangle. In many parts of the country there is currently a real desert of Angel investment and we need to build more capacity. Jenny gave an overview of the market and shared some of the latest trends and developments. The average amount for an individual Angel Investment is between 10 – 50k. 75 % of deals made in the UK are done in syndicates. Jenny acknowledged that it’s a really tough world out there doing it by yourself and syndicates are a brilliant way to share due diligence, share risks and increase capability of follow-on funding. One of the challenging things in the investor world is the really long journey to exit nowadays – the average time is 8 – 10 years. There are not enough women in the Angel market, this is a completely untapped pool of fantastic people who should be out there investing. Our research shows that only 14 % of Angel investors are women. UKBAA spoke to 200 women (110 investors and 90 non- investors) to understand the drivers for women to invest and the barriers that they are feeling for investment. It was interesting to find that women are not being advised to invest by financial advisors – they’re being given easy stuff to do, with limited risk. They’re being advised to invest in property and stocks and shares as these are regarded as less risky. Women we spoke to said that they are not being told about tax breaks and the opportunities for backing great businesses. Women would love to put something back in to the economy, are fascinated by small businesses but don’t know how to do it. UKBAA has recently set up a campaign to help more women invest. Recognising that there is still a long way to go, Jenny advised that she wants to move the percentage of Angel female investors from 14% to 30% and pledged UKBAA’s support. She concluded, “Having more women in the market investing will in turn help more female entrepreneurs to come forward to seek investment. Peter is a man who has fully embraced Angel Investment with 60 personal investments to date. He talked about his core investment criteria which has been built up over his 8 – 10 years of investor experience. He advised how he never invests in companies more than an hour’s public transport journey from home. Best team size to invest in? “3 is great, 2 is good, 1 is no good but 4 is too many. Any more than that and there’s a much bigger pie that the entrepreneurs want money out of. Entrepreneurs must listen - listen to their staff, listen to the market, to their suppliers and customers and listen to their Angel investors. They must also not lie – the truth between entrepreneurs and investors builds trust and creates a better journey for all parties. Make sure that you do due diligence on both sides. Entrepreneurs must also do it on the investors too, this is hugely important. Unfortunately, only 7 % of my investments are in women. This is mainly because I invest in STEM. Hopefully this will change though. I don’t mind entrepreneurs who have previously made mistakes, in fact I like those who have made mistakes and learnt from them and moved on. Back a team. Remember the old adage that a poor idea and a good team is a better bet than a bad team and good idea. Have some chemistry with your team, like them and you’ll get a lot more out of them and achieve more. Don’t back founders in personal relationships - if they ever disagree with each other this could cause a huge problem for the business and the investors. Seasoned investor Justin Levine talked about his decades of experience of buying and selling companies. He reflected on the lessons learnt along the way and how to avoid getting it wrong and how to minimize the downside. Be a part of the organisation that you invest in and sit on the Board – understand the difference between economics and control. As minority stake holders you can chose to have veto or voting rights over key important things that happen in that business. Having a level of control in the business is quite important sometimes. EIS and SEIS – occasionally it’s good to put in convertible debt and to understand what that means, which is loaning the company money and turning it in to shares downstream. It avoids unrealistic valuations. Liquidation preferences – there are ways to structure investment to ensure that you can get your money out before a liquidation event, there are mechanisms that you can put in place. Kurt Lyall, CEO & Co Founder of Rocket Route gave an insightful presentation about ‘Exit lessons for Investors’ from the founders’ perspective. He uncovered lessons throughout the investor journey; from seed investment – Bridging – Series A investment – Series B investment. Investors, always be as positive as you can be in any situation, stay involved and be informed. Be aware that building for an exit can also be a distraction. If your business is approached, take pride. It is a validation of your business and your achievements. Organise yourselves ASAP. Be responsive and get a strategy together. Try and bring everyone with you but also work up a plan B.
Angharad Holloway, Head of Talbot Heath School in Bournemouth was invited to take the floor to talk about the School’s ambitious THINK BIG vision and how they are blazing a trail on a local, national and global platform. She advised that the school is preparing young people for the jobs that they will do in the future and not regressing back to the education model of the 50s. She talked of her personal mission to look ahead to the 2050s and teach all pupils creativity, design thinking, material science, digital proficiency and problem-solving. Angharad enthused, “The future will be powered by STEAM – not just science and technology but also crucially arts. We need to retain our innovation, creativity and thinking. We are looking forward to pioneering an educational model that will inspire a generation to ‘think big’ and take on the challenges of the future.” Several of the audience expressed interest in speaking to Angharad further about her vision. Bill Cotton, Executive Director, Environment and Economy at Bournemouth Council talked about how Dorset is alive with opportunities, the multiple inward investments into Bournemouth and key developments in the town. It was acknowledged that this is making Bournemouth a great place for businesses to relocate to and invest in. The conference culminated in a lively Q & A session on stage with the guest speakers. They were also joined by Nick Fernyhough of Saffery Champness and Scott Jones of Investec Wealth, both event sponsors. A diverse mix of questions came forward from the audience. What comes first – the quality of a team or the quality of a plan? What makes a good place to set up a business? What do you consider to be the wow factor when individuals are pitching? Is it a concern that exits periods have gone from 3 -5 years to 8 – 10 years? What a brilliant afternoon it’s been. The audience has been hugely engaged and we’ve enjoyed welcoming approximately 100 people to our event. It has been a great learning experience for all, even the speakers! At a time when it is so important to back small businesses in this economy, it’s been great to see such a good gathering of investors. Dorset Business Angels is going from strength to strength!